You often see yogis doing this beautiful yoga pose in picturesque landscapes. But more than its aesthetic appeal, I truly love the pose because it means my body is open enough to go in to a deep hip opener and backbend. 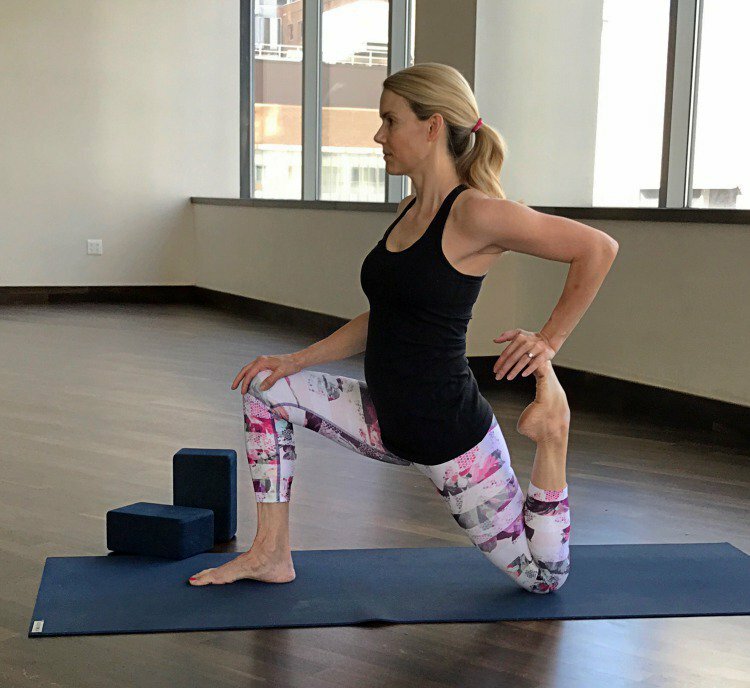 As a beginner, you may find this pose daunting; but it is fully doable if you warm up properly and use props if need be. Here are some tips and a step-by-step guide for beginners to practicing Mermaid pose. Hopefully this will help you find the posture more accessible so you too can start practicing this beautiful yoga pose. To get started, do several rounds of Sun Salutations then perform Warrior I, Warrior II, Extended Side Angle, and finally, Low Lunge with Cow Face pose arms on both sides. 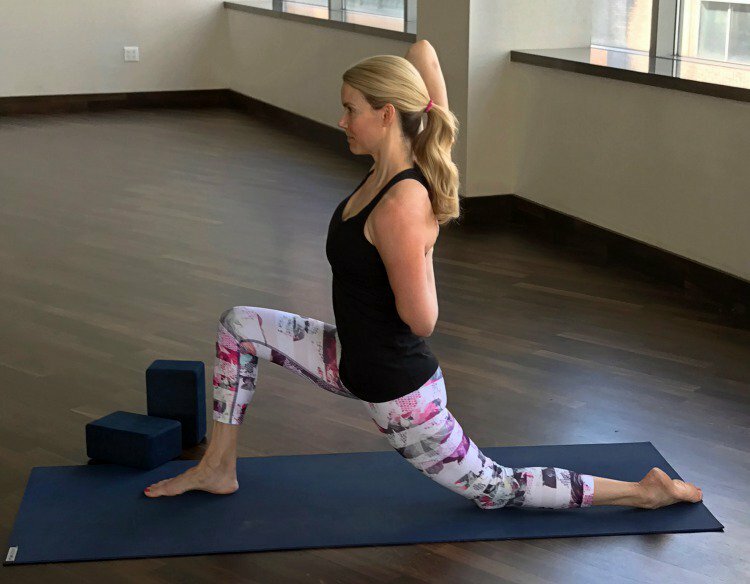 This variation on the arms in Low Lunge will help you open your shoulder while you work on a backbend in the upper body. Next, come in to proposal pose with a deep quad and hip flexor opening. Drop your knee (pad it if need be) to the floor, lift your torso upright and engage your core. Grab hold of your foot and pull in towards your hips. If you can flip the palm around and turn the fingers forward, you’ll get an even deeper stretch. Hold five to eight full breaths on each side. Now you’re ready to attempt mermaid. Come in to Pigeon pose on your right side. Make sure your knee is open to the right of the hip. Slide your left leg back as far as you can. If you want to, place your hands on blocks outside of your hips, and slightly forward. You can find a deeper stretch in the hip flexor and align your hips facing forward. Make sure you’re staying on top of the left thigh and not sinking in to the right hip. You can modify by placing a block under your right hip as well. Reach back and grab hold of your left foot and stretch it towards your hip like you had done in proposal pose. Hold for five to eight breaths. Take the foot in the crook of your left elbow and reach your right arm overhead to hold hands. If you can’t clasp the hands, you can also use a strap around the foot and hold with the other hand overhead. Step back in to Downward Dog and repeat on the other side. If at first your can’t hold the hands, stay with a strap or just holding the foot with the same hand as you gain more flexibility. Make sure to use the breath and keep your abdominals engaged. You don’t want to feel any pain in the lower back. The backbend should come in the upper body so keep lifting your heart upwards and you’ll find the pose becomes even easier. Soon enough you’ll find the elegance of the mermaid and you can share beautiful pictures of yourself performing the posture. But most importantly, you'll feel pride in yourself for taking the time to open up your body and listen to your breath. Going into a deep backbend in a big hip opener is challenging, so take your time and enjoy the process as you move closer to the final expression of the pose.